It's big and it's beautiful. Weighing in at nearly five pounds and possessing an eye-catching cover, Sports Illustrated's latest addition to its sports pictorial series has entered the world of golf. And it has taken it on in spectacular fashion. 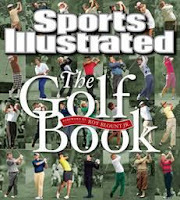 SI's THE GOLF BOOK is a heavyweight in the world of golf books – literally and figuratively. As it sits in our library it is second in dimension just lagging behind Jack Nicklaus Simply the Best, but first in quality. As it rest in our mind it's on the top rung of our fun ladder. A certain amount of text and facts are involved but that is at a minimum. But don't skip the text. The articles, all by SI staff and contributors, are timely to the period and absorbing today. There is a enchanting essay by Bernard Darwin on Francis Ouimet's victory in the 1913 U.S. Open that is highlighted by a photograph of Ouimet's scorecard which was kept by Darwin. Lots of history on that page. And don't forget to read the forward by Roy Blount, Jr. It's cleverly done and a fun read and gets you into the spirit of the book. However, in the end this volume is a photographic essay of the history of golf. The publication is separated into seven chronological sections categorized generally by historical significance. The pictures and text included in each division are pertinent to the era. Our favorite was the Centerfold - yes, a centerfold. 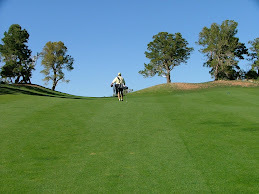 In a poll with a panel of fifteen judges, each was asked to name his or her favorite golfers of all time. The final list and a masterful pictorial montage make up the centerfold. Once you get passed the centerfold, don't hastily pass by the pictures of equipment, clubs and balls in particular. You'll get an appreciation as to how the game has changed. If there is a golfer in your life who has the the slightest interest in the history of the game, this is the perfect book to place in his or her library. While the game of golf can always be a great topic of conversation, this volume itself will generate great quantities of verbal communication. It is a must have for every golfer. We could go on and on and on and … extolling the virtues of this book. Just get it! You're so fascinating! I don't trust I have perused something like this some time recently. So awesome to discover somebody with a couple of honest to goodness considerations on this point.